Now that Spring is here, it’s the perfect time to declutter and get organized as part of your Spring cleaning routine. This month’s reader appreciation giveaway is going to help you do it! The prize this month is a set of versatile foldable boxes from Meori. These aren’t just handy organizing pieces, they’re also really attractive so you’ll be inspired to use them throughout your home! Each month I team up with my friends, Andrea from Homemade for Elle and Susan from Organized 31, to share a giveaway as a way to thank our readers for your ongoing support. We are so grateful for your visits, comments and emails. Many thanks to Meori for sponsoring this month’s giveaway. Meori makes foldable organizing boxes that fit into standard shelving units and can hold up to 65 pounds. 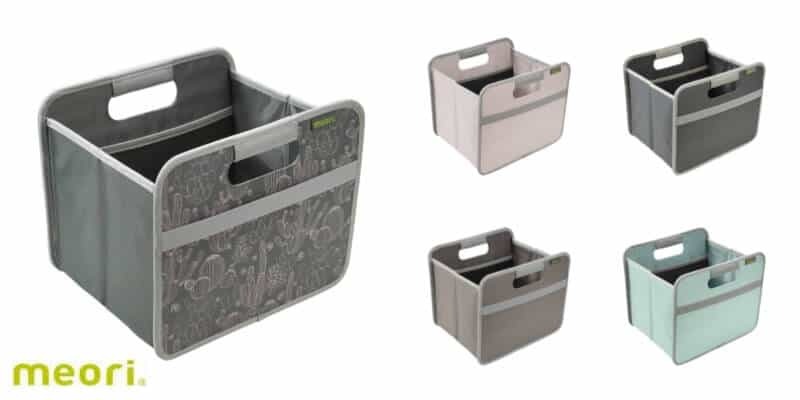 In addition to organizing, they’re great for sorting laundry, carrying items to a potluck (a spring form pan fits perfectly) and so much more. I would use them in my walk in closet to organize things. Would be perfect in my craft room. I would use them to better organize my office.